Many workers could see a bump in their take-home pay as employers start using the new IRS income tax withholding tables. The Congressional Budget Office estimates employers are likely to withhold $10 billion to $15 billion less from workers every month as a result of those tables. 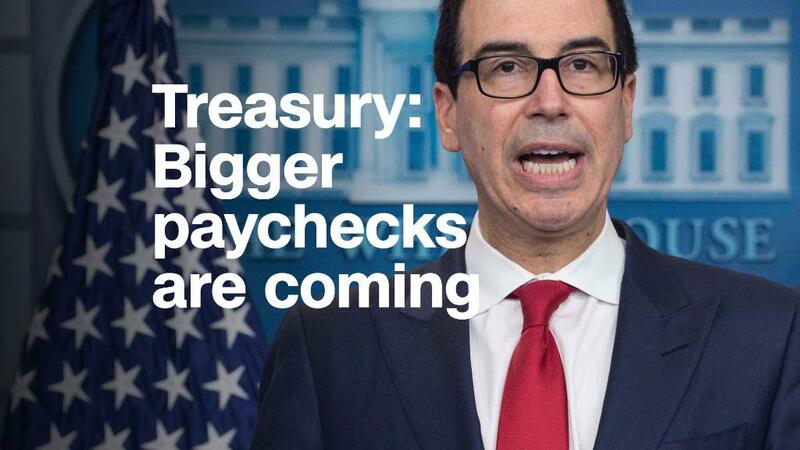 To give you a ballpark idea of how the tax cuts might translate into higher take-home pay, CNNMoney asked payroll service provider ADP to make estimates for two types of filers who get paid every two weeks: a single filer taking one withholding allowance and contributing 5% of his paycheck to a 401(k); and a married joint filer taking two allowances and also socking away 5% in a 401(k). Among single filers grossing between $46,000 and $162,000, their bi-weekly paychecks could go up by between $40 and $190 relative to last year. For instance, someone making $57,000 may see roughly $60 more per paycheck. If she grosses $162,000, her take-home pay could rise by $190. Married workers making between $51,000 and $167,000 might see anywhere from $30 to $172 more per paycheck. So, for example, a joint filer making $61,000 might see an extra $40 every two weeks. If he grosses $114,000, his net pay could rise by $115 every two weeks. What bump, if any, you see in your paycheck will depend on a lot of factors beyond your salary and how many allowances you take. And those other factors could undercut any increase in pay that you would otherwise see from the federal tax cuts. For instance, if your state or local income taxes have gone up or if your health benefits or other benefits deductions changed for 2018, that could curb how much extra take-home pay you get. "For lots of folks, the tax cuts are lost in a sea of other deduction changes, which also happen January 1," said Pete Isberg, ADP's vice president for government relations. Whether or not your take-home pay goes up noticeably this month, you should review your withholding allowances. Here's why: The new withholding tables may end up withholding less tax from your paycheck than what you actually will owe, or just less than you'd like if you're banking on a big refund next year. Normally, withholding tables simply offer the best approximation of how much tax should be withheld from your pay. But this year, it could be an even looser approximation. The problem is the new law makes big changes to the elements that have driven how many allowances you've been claiming: It eliminates personal exemptions, reduces itemized deductions and alters tax credits. So the number of allowances you chose the last time you filled out a W-4 might be way off now. "Since personal exemptions were repealed, any allowances [you take] should roughly reflect expectations as to itemized deductions or tax credits to which you are entitled," Isberg said. How do you figure that out? Talking to a tax adviser is one route. A cheaper, faster way would be to use the new withholding calculator that the IRS plans to put out at the end of February. It should help you assess whether you're claiming too many or too few allowances given all the changes to the tax code. If you end up deciding you want to change the number of withholding allowances you take, you need to submit new instructions to your employer, which your company may let you do online. The IRS will also be publishing an interim W-4 form for 2018 in conjunction with the calculator.